The Hygromycin B EZ Pak™ is the fastest and easiest way to make a set amount of sterile hygromycin B solution. The kit includes pre-weighed hygromycin B powder, a sterile filter and a sterile container for the filtered solution. No need to calculate, simply add the stated amount of deionized H₂O, filter, and pour into the labeled bottle for easy usage. 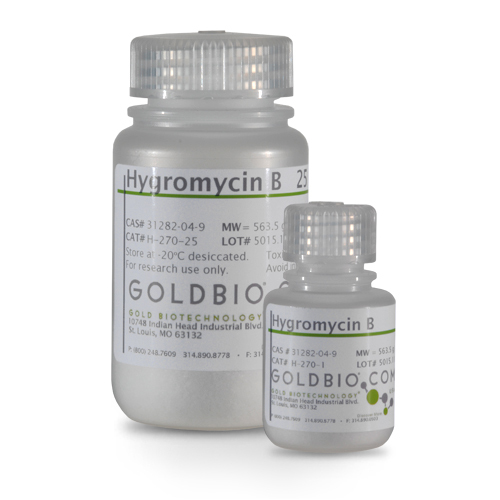 The EZ Pak™ includes high quality GoldBio hygromycin B and the sterile solution is ready for tissue culture, bacterial media or any other appropriate use. The 25 ml, 50 ml, and 100 ml pack sizes require a vacuum manifold for easy vacuum filtering, while the 10 ml pack size comes with a syringe filter. EZ-Pak Protocol for Reconstitution and Filtration of Hygromycin B.
Hygromycin B Cell Culture and Plate Preparation for bacteria, plant and mammalian cells and yeast.